andconsumer-grade digital still camera systems. Operators can perform visual inspection and measurement of small items or components without complicated system setup. Mitutoyo Digimatic Micrometer heads have serial output for SPC applications. MC Series Systems are available in 110 or 220 volt, incident or transmitted, binocular or trinocular configurations. 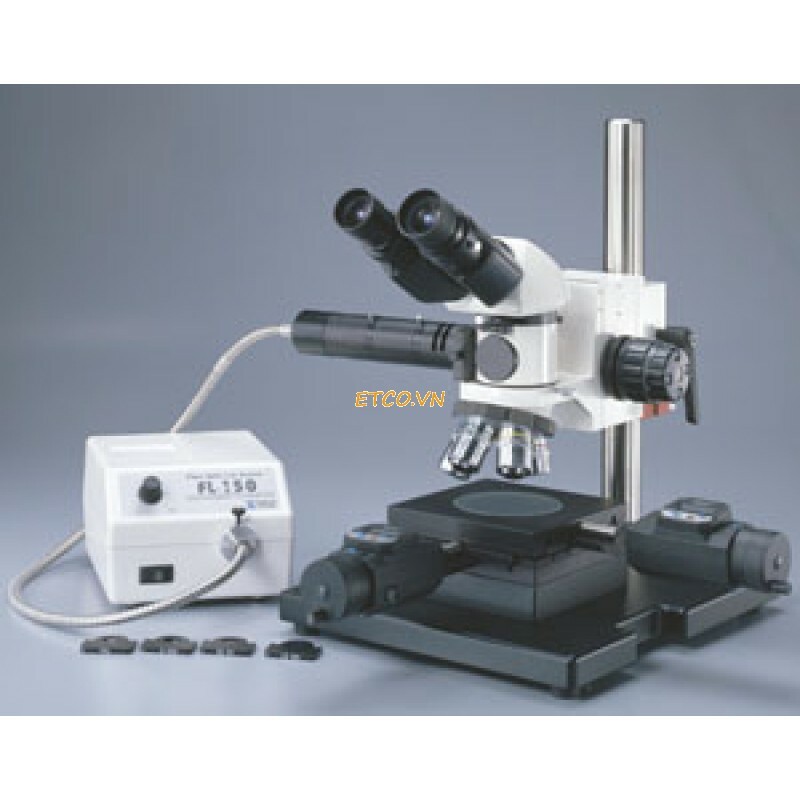 Our Model MC-60 is a reflective light brightfield/darkfield measuring microscope withbinocular head. The Model MC-60T, shown at left, is an incident and transmittedlight brightfield/darkfield measuring microscope withbinocular head. The MC-60T can also convert into a reflective light unit simply by moving the light guide from the base into the vertical illuminator tube. Our Model MC-70 is a reflective light brightfield/darkfield measuring microscope withtrinocular head. 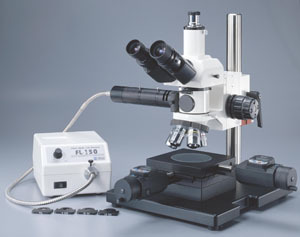 The Model MC-70T, shown at right, is an incident and transmitted light measuring microscope with trinocular head.The MC-70T can also convert into a reflective light unit simply by moving the light guide from the base into the vertical illuminator tube. Vertical Koehler illuminator, focal length 200mm, with sliding rotatable polarizer, infinity tube lens. Filter Set: Blue Clear, Green Clear, Neutral Density ND25, and Polarizing filters in metal mounts. Port to accept FL150/12 flexible 36" (914.4mm) single arm fiber optic light guide. Flexible 36" (914.4mm) single arm fiber light guide for FL150/115. Binocular head - Siedentopf type, I.P. adjustment 53mm to 75mm, graduated diopter on left eyetube (30.0 mm I.D. eyetube). Inclined at 30 degrees. Trinocular head - Siedentopf type, I.P. adjustment 53mm to 75mm, graduated diopter on left eyetube (30.0 mm I.D. eyetube). Inclined at 30 degrees. Trinocular head - Siedentopf type, erect image with sliding 0/100 beamsplitter, inclined at 30 degrees, I.P. adjustment 53mm to 75mm, graduated diopter on left eyetube. Vertical Koehler illuminator, with sliding rotatable polarizer, infinity tube lens, focal length 200mm, with clear blue, clear green, and ND 25, neutral density and polarizing filter in metal mounts. Port to accept FL150/12 flexible 36” single flexible bundle light guide. * Note: MTI164-164 Digimatic Micrometer heads for X-Y axis movement and MTI543-392 Digimatic Micrometer heads for Z axis movement are sold separately.